From diagnosis to treatment, our team of sarcoma specialists utilize the latest technology and treatment protocols with a continued goal of positive outcomes and quality of life for each and every patient. Thank you for entrusting your patients into our care at West Cancer Center & Research Institute. West Cancer Center & Research Institute is positioned as the region’s comprehensive leader in adult cancer care and research. Our team at West offers unparalleled Sarcoma Cancer treatment for patients across the Mid-South – from screening to survivorship- we provide your patients with the most individualized care possible. Our team of Sarcoma specialists utilize the latest technology and treatment protocols with a continued goal of positive outcomes and quality of life of each and every patient. Sarcomas are one of the more rare cancers. They are cancerous tumors of the connective tissues in the body, such as fat, blood vessels, nerves, bones, muscles, deep skin tissues, and cartilage, but they can also happen in other areas of the body. 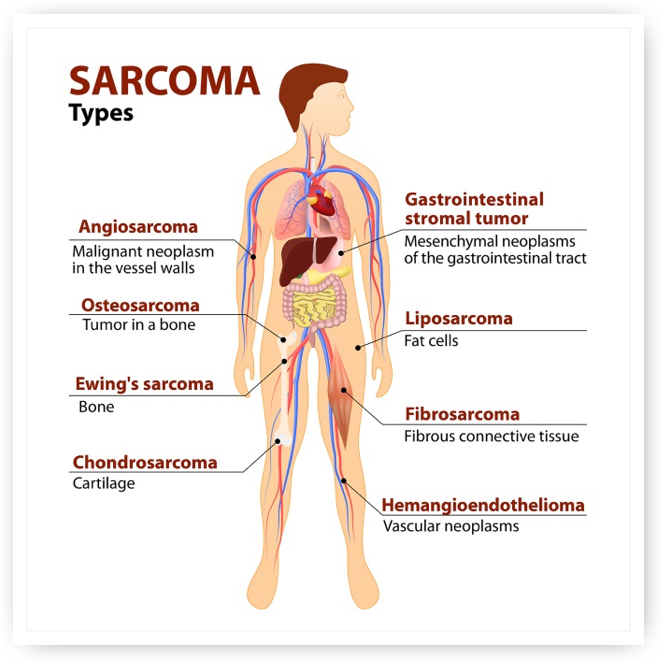 Although there are more than 50 different types of sarcomas, they are classified in two main groups: bone sarcomas (osteosarcomas) and soft tissue sarcomas. They are then sub-classified by the type of presumed cell of origin found in the tumor. They all share certain microscopic characteristics and even have similar symptoms, such as pain in the affected area or a lump felt through the skin. Soft tissue sarcomas typically go unnoticed until it becomes a sizable mass due to a lack of symptoms. Below are some symptoms one may experience. Most often, this is the first sign of a sarcoma. It is a painless lump felt under the skin. As it grows, it could press against nerves or muscles causing discomfort, trouble breathing, and pain. Once the tumor affects local tissues, nerves, or muscles, a sarcoma can be felt as pain (weak or severe depending on factors such as size and location). A tumor can grow large enough to eventually affect an area through inflammation and swelling. Inability to move limbs properly (if a sarcoma affects an arm or leg) and other impairments of a specific location may be a sign of a sarcoma. Specific symptoms may reflect the particular type of sarcoma such as, tumors in the gastrointestinal system may bleed causing blood in the stool, or stool that has a black, tarry appearance. If you have a patient experiencing any of these symptoms, we urge you to contact us. A sample of tissue is removed for examination and to determine a diagnosis. Are used to get a closer look at the mass within the body, without surgery. Your patient may receive a CT scan, ultrasound or MRI. If we suspect that he or she has an osteosarcoma (bone sarcoma), they may receive a bone scan for further investigation. A sarcoma treatment plan will vary depending on a variety of factors including, but not limited to, the location, type, stage, size, and whether it has metastasized (spread to other parts of the body). A dedicated team of cancer specialist will discuss the treatment options and plan with you patient , and allow them and their loved ones to consider all possible treatment options. Surgery is the removal of the tumor and some surrounding healthy tissue during an operation. The surgeon’s goal is to remove the tumor and enough normal tissue surrounding it to obtain a clean margin around the tumor. A “clean margin” means there are no tumor cells visible at the borders of the surgical specimen. This is currently the best method available to ensure that there are no tumor cells left in the area from which the tumor was removed. Targeted therapy is a cancer treatment that works by targeting specific genes or proteins to help stop cancer from growing and spreading. These genes and proteins are found in cancer cells or in cells related to cancer growth, like blood vessels. It may seem simple to use a drug that works specifically to your type of cancer, but targeted therapy is very complex. It is important to remember that a tumor may not always respond to a drug – each person and each tumor is different. Targeted therapy is an important type of cancer treatment, but so far, there are very few targeted drugs that have shown impact on cancer. Most people may also need surgery, chemotherapy, radiation or hormone therapy. Researchers are always in the process of developing more targeted drugs and West Cancer Center is at the forefront of research, targeted therapies, and clinical trials. Radiation therapy is the use of high x-rays or other particles to destroy cancer cells. Radiation therapy may be done before surgery to shrink the tumor so that it may be more easily removed. Radiation therapy may also be done after surgery to remove any cancer cells left behind. Radiation treatment may make it possible to do less surgery, often preserving critical structures in the arm or leg if the sarcoma is located in a limb. Chemotherapy is medication that destroys cells that are growing and dividing. Cancer cells grow by dividing, and they grow faster than normal cells. However, normal cells also grow and divide, so chemotherapy affects both normal and cancerous cells. Chemotherapy is often used when a sarcoma has already spread. It may be given alone or in combination with surgery, radiation therapy, or both. 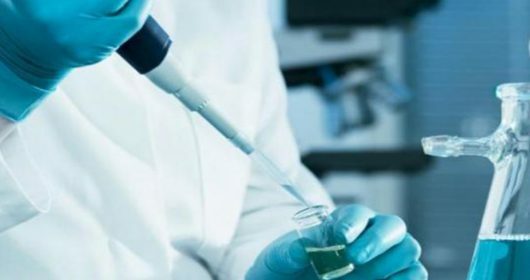 If a patient has not received chemotherapy before surgery, chemotherapy may be given to destroy any microscopic tumor cells that remain after a patient has recovered from surgery. The side effects of chemotherapy depend on the individual and the dose used, but can include fatigue, risk of infection, nausea, vomiting, hair loss, loss of appetite, and diarrhea. These side effects usually go away after treatment is complete. To learn more, please click here to visit the American Cancer Society’s website for more information.